After years of foisting dashed-off 3-D — and its inflated ticket prices — on movie audiences, studios may have found their most reliable ally yet in shoring up box office: IMAX. And not just the punch and potential of the brand's own 3-D, either, but good old conventional 2-D as well. Call it the IMAX Old Wave. Led by last weekend's $155 million Hunger Games windfall — $10.6 million of which came from the giant-screen format — more and more evidence suggests that audiences are both showing a preference for IMAX and happily forgoing often-reviled 3-D visuals. Just as important, and perhaps far more telling, blockbuster directors like Christopher Nolan and Brad Bird are making influential use of IMAX technology to augment their creativity. Those results have been roundly embraced by critics and crowds, all while 3-D continues generating negative feedback and diminishing returns. Are the studios finally ready to follow filmmakers around the corner? Maybe, if cinematographer Robert Elswit's recent experience is any indication. The move underscores both the creative and commercial advantages in turning away from the muddy visuals of the ongoing 3-D "renaissance" in favor of the optimal experience of regular, two-dimensional IMAX viewing. The company itself has recognized this, delivering increasingly fan-friendly franchise titles (many of course, like Harry Potter and the Deathly Hallows - Part 2 and Transformers: Dark of the Moon, still in its proprietary IMAX 3D) while aggressively expanding to nearly 600 screens in 48 countries. Currently the company is well into a project that will add 15 new venues into China. Meanwhile, as Hollywood rebounds from last year’s dismal box office, IMAX has actually outpaced that success. Even before Hunger Games landed the third biggest opening weekend of all time, Hollywood had seen a 20 percent increase in year-to-date grosses over the same time frame in 2011. 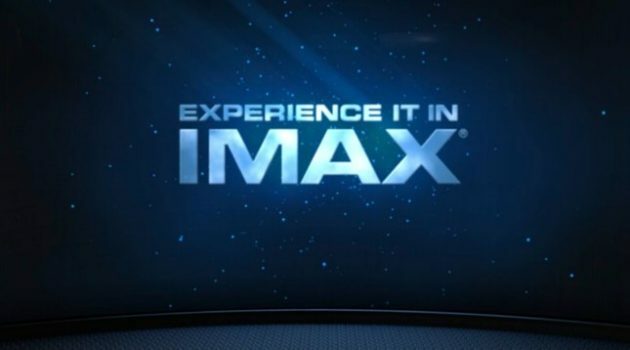 During this same time IMAX has enjoyed a 45 percent surge over last year’s numbers. Even the bomb John Carter boasted a healthy 17 percent of its meager opening from IMAX theaters. IMAX has such a busy slate this year that despite clearing 270 screens for Hunger Games' debut in North America (and an additional 19 venues in the U.K. and France), it has to edge out the blockbuster after a week to accommodate its commitment to today's Wrath of the Titans. This is not a fluke. The Canadian juggernaut has cultivated a following among viewers and filmmakers alike for four decades, with the more of the latter gravitating towards the 65mm format in recent years. Nolan, a longtime proponent of the technology, was instrumental in ushering in the IMAX Old Wave with his 2008 megahit The Dark Knight, while Bird and Elswit followed suit in 2011 with Ghost Protocol. “Brad wanted to use IMAX right from the start, and that was mainly due to Chris Nolan’s success in using it for sequences in his Dark Knight film," Elswit told me. 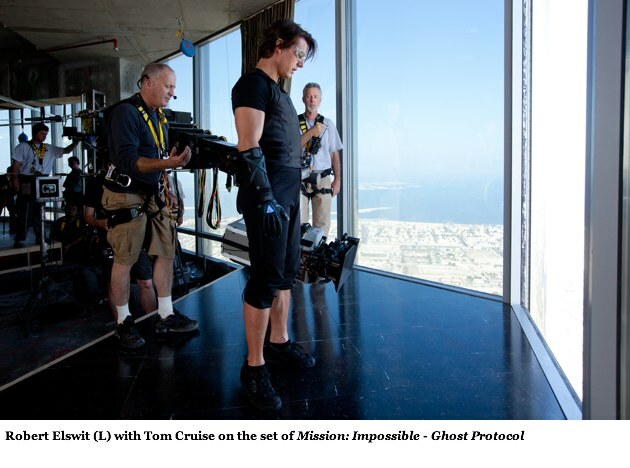 "We decided that we wanted to use IMAX cameras to shoot four or five of the action sequences” — most famous being the thrilling Burj Khalifa scenes, featuring Tom Cruise actually scaling and bounding around the top of the world’s tallest building. Then, in another unique move, Paramount debuted Ghost Protocol exclusively on 300 IMAX screens five days prior to its wide opening. From the shoot to the release strategy, the format conferred an event status that helped nab the film $45 million in IMAX grosses alone and represented the first wave in a nearly $700 million global phenomenon. Asked to elaborate on the specific cost differences of producing 3-D versus standard IMAX, Elswit demurred. But the implication was clear for the filmmakers weighing both formats: On the whole, IMAX wields the bigger bang for one's buck. Proponents of 3-D — even those inside IMAX's front office — face other challenges and red flags regarding the format's long-term viability. As a side-by-side comparison of established auteurs embracing technology, we can look back to Martin Scorsese's reported $170 million family film Hugo: While lauded by critics and winning multiple Oscars — including Robert Richardson's eye-popping 3-D cinematography — the film grossed only $73 million domestically and barely broke even once foreign markets are taken into account. Other telling statistics came with the hit film The Lorax, whose hefty $70 million opening far exceeded expectations. Industry investment analyst Richard Greenfield found that while 3-D screens represented a nearly two-to-one majority of The Lorax's theater count, the grosses expose a nearly even split between 2-D and 3-D. The per-screen average shows that more money was made in conventional screenings, a stunning figure once you factor in the inflated 3-D ticket prices. That breakdown means that while 60 percent of the screenings were displayed in 3-D, 60 percent of the audience watched in 2-D. Greenfield also noted the underperformance of Harry Potter and Deathly Hallows - Part 2 on IMAX 3D — a figure amounting to only 9 percent of its record-breaking $169 million opening gross — further arguing that if viewers had had more 2-D options, the 3-D share would have been even lower. Meanwhile, Hunger Games director Gary Ross — who has proclaimed his "love" for 3-D yet distanced the burgeoning franchise from the format ("I think that if we shoot this movie in 3-D, we become the Capitol," he told one interviewer. "We start making spectacle out of something that I don't think is really appropriate here") — has already dictated that his sequel, Catching Fire, will likewise be projected in the traditional format. And those movies' promise notwithstanding, IMAX CEO Richard Gelfond isn't taking his company's growth — in any dimension — for granted. "For us, one weekend and one film does not make a year," he cautioned this week. "And that's one thing you've really got to be clear [about] with investors and analysts." Nevertheless, if artists' preferences continue to mirror their audiences' tastes, the combination may yield an inescapable influence on Hollywood's decision makers. And once sizable, steady profits can be found on the 2-D side of the ledger, studios and IMAX won't have any choice but to listen as the money does the talking. Brad Slager has written about movies and entertainment for Film Threat, Mediaite, and is a columnist at CHUD.com. His less insightful impressions on entertainment can be found on Twitter. That is one of the reasons I specifically highlighted the use of the IMAX technology in lauding the format. The best way to savor the effect is to watch it in a true IMAX theater, and to have the content shot with IMAX cameras on 65mm stock. It is a boon for audiences that more directors are moving in this direction. Actually, the screen people like Ebert and Aziz Ansari regularly quote as what an IMAX screen should be represents the largest IMAX screens in the United States. There are only two IMAX screens of this size in the States, Lincoln Square in New York and the Metreon in San Francisco. So beware of uninformed people who only get their information from movie critics and television actors. This continues to be a ruse to me and false advertising. Mr. Elswit states, "As it turns out, Dubai has an IMAX theater, so we were actually able to go there and see out dailies in IMAX." The key word is "AN", as in only one, the REAL IMAX. The quality in the smaller IMAX theaters is not improved by shooting in 15 perf, this applies only to the big screens. @ledoctor, couldn't agree with you more! Is this what cartoons teach about respecting others these days? A bad performer does not equate a bad person. Shame on you Guyx. You miss the point, GUYX. This isn't about whether you liked a movie or not, it's about having to pay an extra five bucks for something that isn't what it says it is. Double shame on you. Yet another important part happens when you are senior citizen, travel cover ideal for pensioners are some things that is certainly important to think about. The better aged you will be, better at an increased risk you’re for obtaining something negative take place whilst in most foreign countries. If you aren’t really paid by several comprehensive insurance policy, you have numerous serious issues. Appreciate your revealing your information on this website. The rest of the world knows, not all of us will tolerate terrorism. New York socialite turned fashion designer Tory Burch first released this shoe in a leather version a couple years back.